A woman in her 80s died when she was hit by a car. 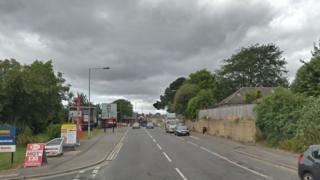 Dorset Police said she was walking in Somerford Road in Christchurch, Dorset, at about 15:30 GMT when she was struck by a Ford Focus. The woman, from Christchurch, was pronounced dead at the scene. A man in his 50s has been arrested on suspicion of driving offences and is being questioned by officers. The force said it was appealing for witnesses and anyone with dashcam footage.